All of us – babies, toddlers, teenagers, parents and grandparents have the same emotional needs. Meeting these needs in childhood provides the foundation for success in school, work, relationships, marriage and life in general. We see it in our daily lives and the news, failure to meet the emotional needs of our children is a serious and under-recognized problem facing our country. 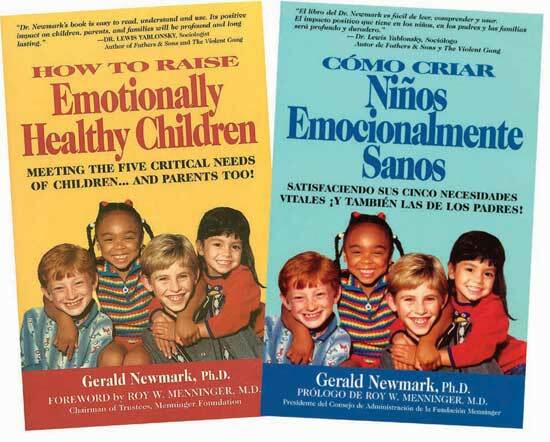 Dr. Gerald Newmark, in his book How to Raise Emotionally Healthy Children: Meeting the Five Critical Needs of Children…and Parents Too!, shows parents and teachers how to nourish emotional health at home and at school. The book helps parents recognize and satisfy the critical emotional needs that all children have: to feel Respected, Important, Accepted, Included, and Secure, and in the process, parents will benefit too. In the coming weeks, we will present a series of articles with more information on meeting each of these five emotional needs, including tips and activities. We’ll also address “behavior that hurts and behavior that helps”, as well as how to become a professional at parenting. These simple, powerful tools will enhance the lives of children, parents and families. The goal is to raise children to be self-confident, independent, responsible, thinking, caring, and civic-minded individuals. Parents’ opinions, values, attitudes, and actions, matter to children. We don’t think of children as having the same needs as adults, and we do not realize the effect we have on them by what we say and how we say it. For example, it is just as easy and takes the same amount of time to say, “I’m sorry honey. I don’t have time right now,” rather than “Can’t you see I’m busy? Stop bothering me!” With children, a simple act of courtesy can go a long way. These behaviors in us, as parents, will help us cultivate these values in our children. Next time, we’ll be discussing the emotional need to feel Important. Until then, consider… When you were a child, were you constantly interrupted before you could finish your thoughts? To learn more about Dr. Newmark and The Children’s Project go to www.emotionallyhealthychildren.org. You can also visit us on facebook: http://alturl.com/ok8rb and follow our tweets on twitter: @emotionalhealth. To order the book How To Raise Emotionally Healthy Children by Dr. Gerald Newmark go to amazon.com. Available in book, Kindle and audio.